I have been a subscriber with The Organic Box for 5 and a half years now, and I have not regretted one minute of it (read about my journey here). I had the opportunity to try a bunch of other products The Organic Box offers (other than produce) – so I’m going to review them here for you! I never thought I’d get so excited about apple juice. I mean, apple juice is apple juice, right? As long as it’s made from organic apples. Well this is seriously the best tasting apple juice I’ve ever had. It’s cold pressed from Jonagold apples from The Organic Box founders’ farm in Creston, BC (Just a Mere Organic Farm) and comes in a big 5L box with a spout. No added sugars and sweeteners, just pure apple taste. My daughter won’t stop drinking it, I have to cut her off so I get some! I love making roast chicken in the slow cooker, and I pretty much get Sunworks Organic Farm chicken exclusively. (And you can get it in The Organic Box!) I decided to give this cranberry sauce a try with the roast chicken, and it was so delicious. The perfect balance of tangy and tart. Even my husband was a fan, and he typically doesn’t like cranberry sauce with meat! Also – it’s made in Alberta so you’re definitely supporting local! It would be so perfect for Christmas dinner. If you love Bulk Barn, you will love the bulk section of The Organic Box where you can get all kinds of dried fruit, nuts, and other pantry items at bulk prices! These dried cranberries are ALWAYS in our box because they are the perfect snack for my daughter and she loves them. I’ll admit it. I don’t always make sauces from scratch. Sometimes you just don’t have the time or energy. So when I saw this Thai Curry sauce, I knew I had to try it. I used it in a stirfry of green beans, bell peppers, and rice noodles (yes, all from The Organic Box!) and it was scrumptious. It is very creamy and has a touch of hot spicy-ness which was perfect for me (I can take mildly spicy foods!). My husband really liked it as well, though he loves super hot spice, so he would add a bit more hot sauce to it. But he really liked the flavour and texture of it. Definitely going to get this one again! All of Organic Fair’s products are made with organic and fair trade ingredients, and they make them all on Vancouver Island. This Lemon Pepper Sea Salt is a favourite at our house and my husband keeps it close to the barbecue in the summer to season everything! I have also tried Organic Fair’s paprika (one of many spices available), and find it to be very flavourful and more concentrated that other spices out there. There are so many awesome products that I can’t list them all – some of our other family favourites are the Nature’s Path cereals, the Rice Ramen (perfect for those who are gluten-free! ), Sobaya noodles (soba and udon) as well as various flours they carry that are not easily found elsewhere! I had the opportunity to interview Danny & Miranda Turner, the founders of The Organic Box, and ask some important questions about eating “organic”. Here’s what they had to say. 1. There’s some bad press out there that “organic” isn’t actually better for you than “conventional” produce. (reference, my post about Food Babe vs. Science Babe). Why should people choose organic? Trying to understand the nutritional benefits of organic versus conventional is very difficult. It is better to try and characterize the entire life cycle of the agricultural product from farm to table. Organic produce is grown using a holistic approach to agricultural that minimizes the use of chemical fertilizers and pesticides, and prohibits the use of genetically modified seeds and inputs. This promotes healthier ecosystems, cleaner water tables and genetic diversity in our food supply and rural environment. As a result, the ecosystem of organics is better suited to combat pests, disease and blight without the intensive use of chemical applications. The question to ask is which farming practice is better for the entire ecosystem? No farmer wants to poison the earth, but there is very compelling evidence that organic farming does a much better job of maintaining a healthy ecosystem over the long run than intensive chemical farming. 2. I have personally been heckled by people who say that pesticides used in organic farming are just as bad or worse than conventional farming. What’s the real lowdown? Firstly, organic production requires the use of an Integrated Pest Management (IPM) plan. The application of compounds included on the CGSB Permitted Substances List for organic food production is only one component of an agricultural pest management plan, which should also include various non-chemical controls and practices to be used by the producer prior to the application of a control compound. Conventional farming tends to use a program of chemical application that discourages growers from following the circumstances of their own farm (commonly called spraying off-label) in favour of pesticide use that is wide-spectrum and intensive. As a result, the amount of conventional pesticides used in agriculture has skyrocketed since the 1980s. To say that one chemical control is better or worse than any other is not the right question – the right question is how much is being used in the production of a particular food product and is it being used as part of an integrated plan with various controls, or just as a broad-spectrum application whether required or not. Secondly, conventional farming practices can create extreme health outcomes for the agricultural workers themselves through intensive exposure to known carcinogens and poisons at a rate much higher than the average consumers and this should be taken into consideration when making decisions about the food you eat. The World Health Organization has a particular position on this issue with respect to glyphosate and environmental agencies are starting to recognize this risk to farm workers. 3. What makes buying from The Organic Box different than buying organic food at a grocery store? The Organic Box has access to local organic farms that are not found at the grocery store. For example, there is no reason we shouldn’t be eating Alberta organic potatoes year-round but they aren’t found in the supermarkets. When you purchase organic food from us, you can be certain that if it is locally available it will be in your box. When selecting products from farther-flung areas such as bananas, you can also be certain that we select small, family-run, Fair-Trade organic farms rather than from the big agri-corporations which usually fill the organic aisles at supermarkets. It’s about where and who the food comes from. Our products are very special and many of them are exclusive only to us. That is based on personal and long-standing relationships with local farmers. We take great pride in our food family of farmers and producers. We really do mean it when we say we are growing better together. 4. How does The Organic Box decide on what products to carry? We have fairly strict criteria for our products. Firstly, they must be certified organic or transitional organic (it takes three years to get certification). We support transitional organic products in order to encourage farmers to make what can be an expensive and labour-intensive transition. Secondly, if we can get it locally, then we buy local first. We particularly like to support new up and coming organic local products and farmers. Thirdly, we have strong values around the humane and ethical treatment of animals both in how they are raised and killed. We carry only the most ethically-sourced meat products around. Fourthly, we have to feel good about what we sell right down to fair company practices including living wages and caring for farm workers and their families. Last but not least, we listen to our members on what they want in their kitchens. We want our members to be able to get most everything they need from us right down to toilet paper, so we listen carefully to their suggestions. To be honest, our values and criteria sometimes prevent us from carrying popular items such as ‘natural’ products (natural is not a regulated label and can mean just about anything) but what we lose by limiting ourselves so strictly we gain in member trust and loyalty. If it’s in your box, it has been heavily vetted and can be trusted. 5. What are your top tips for living green? Do the best you can but don’t be hard on yourself because the little things you do will make a difference. Switching to organic is a bigger step than you might think: beyond better flavour and personal health, you are benefiting the health of the soil, the ecosystem, and of the farmers. We have seen the effects of long-term pesticide use on the farmers in our own local farming community. So when you buy an organic carrot, you are really taking a big step towards bettering the lives of many people. Feel good about that! So many reasons to choose The Organic Box! Their commitment to sustainable, organic, healthy food systems and amazing customer service are just a few of the things they offer. Plus the fact that they offer everything you need – so you don’t even need to make a trip to the grocery store! 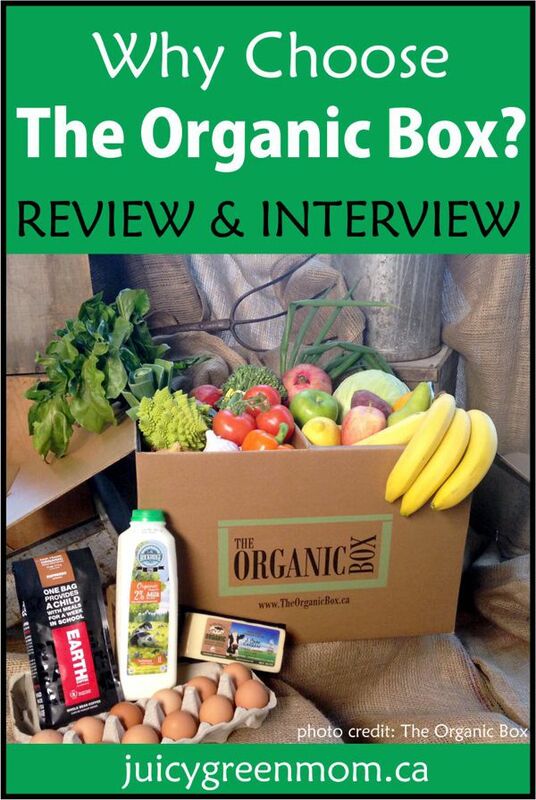 Want to win a $100 gift card to The Organic Box? Enter in My Favourite Things giveaway! What do you think about The Organic Box? THey make a good point that it is one of the few places to get food that is organic AND local – besides the farmers’ markets. Even the organic/healthy grocery stores don’t tend to have local, or only sometimes. Yes, that’s very true! And I think some would argue that buying local has even more of an impact for the environment.